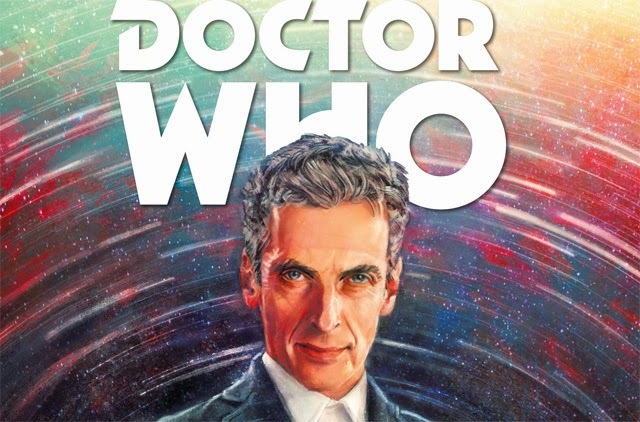 Doctor Who: THE TWELFTH DOCTOR COLLECTION, Vol 1 Review | Warped Factor - Words in the Key of Geek. Tony Fyler gets stuck into the collected works. 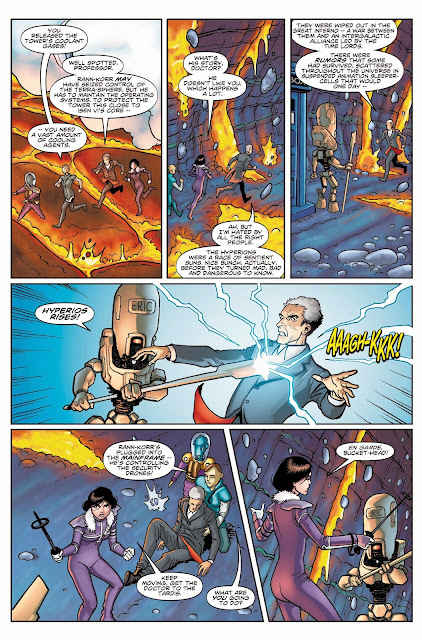 The first collected Volume of Twelfth Doctor stories from Titan Comics is just ridiculously good. Sorry, but let’s take a leaf out of the brusque Doctor’s book and cut to the chase: just go and buy it now, then come back and we can read along together, it’ll save time. Calling it a collected volume might come across as just a little cheeky, given that there are just two stories, but one of them’s The Swords of Kali (as reviewed here and here), so you’re getting a good deal before we even get to the first story, Terrorformer. In terms of stories, Terrorformer’s a bit of a mish-mash – it’s what happens if you smash the Tenth Doctor’s 42, The Hitch-Hiker’s Guide To The Galaxy, a dash of Robots of Death and an episode of Red Dwarf together. If that sounds like it shouldn’t work on any level, we’ve misled you – it does work, but it’s simply solid, rather than staggering or exceptional. That said, the pre-credits sequence here, which is where Robots comes into play, is superb and chilling and the kind of thing that you’d pay good licence fee money to see translated onto the TV screen. The story itself is a straightforward ‘luxury custom-built planet’ idea – thank you, Douglas Adams - where the terraforming goes nuts because Something Else is controlling the process, to the chagrin of those who think they’re controlling it – thank you, Red Dwarf. There are some neat, original, horrifyingly believable touches along the way in Robbie Morrison’s story though – animals with copyright marks on their skin is the gruesomely efficient and logical end-product of the kind of marking and tagging the human race currently does to dairy herds to identify animals belonging to one farmer or another – and the dialogue between the Twelfth Doctor and Clara is first class. There’s a chance some readers will find it all a bit of a re-tread of some David Tennant stories when it flings them into a backstory of ‘Big Bad versus an old-time alliance led by Rassilon of the Time Lords’ (the Tenth was a Doctor who seemed especially beset with grisly enemies that had previously led wars against the Time Lords, or had come from ye olde times – Carrionites, Racnoss, the Beast etc), but the storyline is well constructed, and the solution nicely technological, for all it ends a little abruptly. Anyone familiar with Morrison’s work from the likes of the Tenth Doctor masterpiece, The Weeping Angels of Mons, will know he has a very special knack for honing in on the core character of his particular Doctor, and managing both to deliver a pitch-perfect version of the Doctor you know from the screen, and to extend that version in subtle ways, so you end up with a comic-book adventure that feels very televisual, but often with better budgets and visuals. There’s no sign of that slackening in Terrorformer, though in all fairness, it would probably be a viable mid-season episode, better than a Kill the Moon, but not quite an (insert your favourite episode of the always-contentious Series 8 here). On the subject of those better budgets and visuals, there’s good work in Terrorformer from Dave Taylor and Mariano Laclaustro, helping to give the story a scope and a pace that feels very Twelfth Doctor, very much always moving forward, even during flashbacks. So – good story, great Doctor-Clara dialogue, and art that helps push the pace forward while, when given a newly terraformed planet to envision, also giving us plenty of pretty multi-coloured things to look at. Where’s the bad? That would be ‘nowhere’ you’re thinking of. 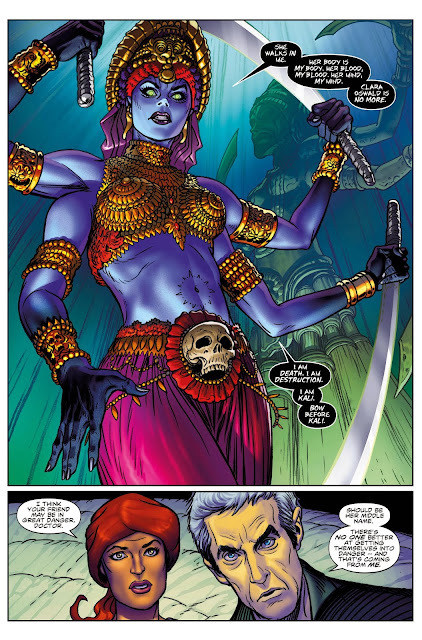 And then, as if that wasn’t enough, then comes The Swords of Kali. The Swords of Kali’s in a whole other league in terms of the big ticks it deserves. Unusual settings – India, in the past and future – big tick. Really sharp – no, really, really sharp artwork and a use of colour that’ll make your eyeballs want to thank you for buying it – big tick. A number of genuinely innovative set-pieces, including a monster chase that exceeds the bounds of the strip’s panels, and a Clara cliff-hanger panel that should be a poster, right now – big tick. Tom Baker – big tick. A lesbian love story, and evidence of the progress of humanity over time in its social grooviness about that love story – big tick. Genuinely creepy monsters, particularly when ‘doing a Silence’ and hanging from the ceiling – big tick. Spot on Capaldi Doctoring, and a chance for the Twelfth Doctor to define himself in a way he only managed once or twice across his whole first on-screen series – ‘Man loves woman. Man loves man. Woman loves woman. Who cares? People hating each other, that’s what bothers me. That’s when the trouble starts.’ – Big ti- Note to self: get a bigger box of ticks next time we review Morrison’s work. 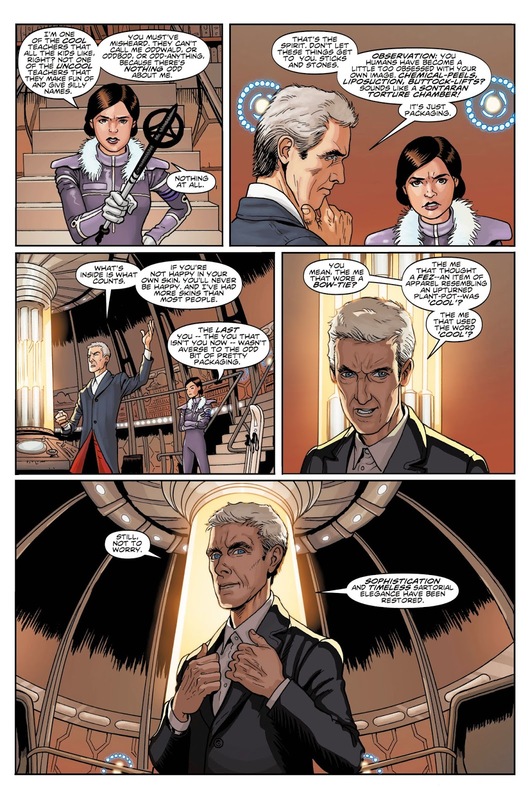 As we mentioned at the start, if you enjoyed Peter Capaldi’s Doctor on screen, you’re going to love the collected Twelfth Doctor Comics, Volume 1. If you weren’t sure, or still need convincing, there may well be enough expansion here to help seal the deal. Only if you happen to be a Claraphobe should you avoid this collection – she’s rendered very clearly in these stories as played by Jenna Coleman – the chirpiness, the smart-alecry, the ongoing backchat to the older incarnation of the Doctor, it all comes screaming across from the TV version, and she’s a big enough part, certainly of The Swords of Kali, for a dislike of her to ruin an otherwise gorgeous combination of tight writing and superb artwork. Personally, we say go for it. The first collection is a combination of a solid mid-season story and a tightly epic marvel that will repay your investment with multiple re-readings. 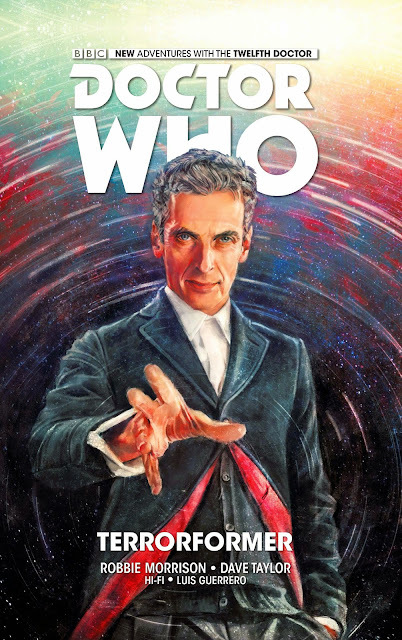 The Twelfth Doctor Collection, Volume 1 is released into comic book stores on June 10th, and book stores on June 30th. 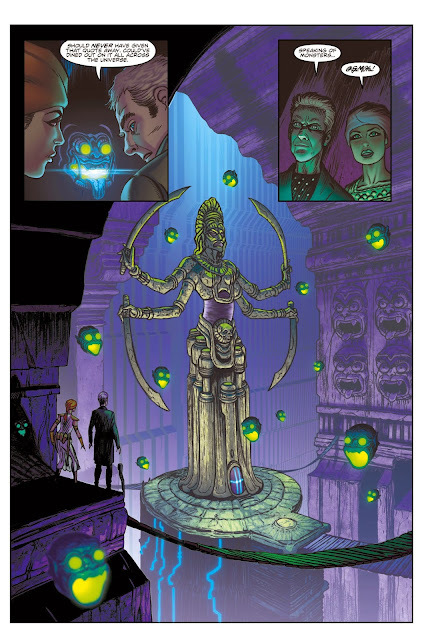 Some sample artwork is included below. To find out more visit the Titan Comics website.